Quora is one among the most popular question-answer sites just like "Yahoo Answers" and "Stack Exchange". But if you are not logged in, it only shows the first answer and asks for sign up to read all the answers. Although a good QA site, not all people would like to really sign up. Tadaaa.. no more popups and all the answers become visible for you. This is not a hack and is a perfectly ethical way. As explained in the Quora blog, the intention of the popup is to encourage people to join the community and not to restrict Quora's answers to members. 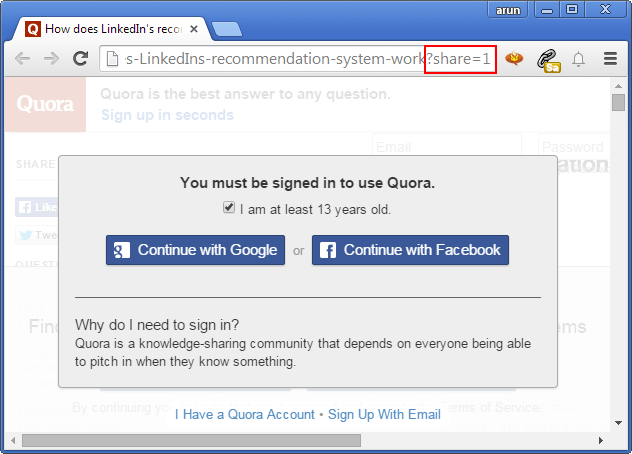 Any Quora answer URL can be used and shared as a non-blocking URL by adding the above identifier in the URL. How to See Cached Copy of Website in Chrome When Offline. Adsense Service Tax For Indian Website Publishers.